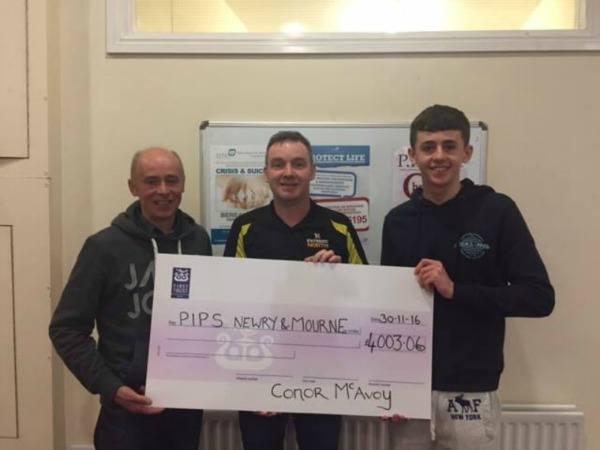 Pictured is Michael McAvoy with his son Conor, presenting a cheque to Eamon Murphy (Fundraising Projects Worker) at PIPS Newry and Mourne for £4,003.06. Conor was given the gift of a skydive as an 18th birthday present. If it wasn’t enough to prepare himself for such a feat, he chose to support the Newry based charity, before taking on a 10,000ft Tandem Skydive at Abbeyshrule in Co.Longford on October 22nd. After setting himself a target of £500.00 Conor soon realised the support he was receiving would soon surpass this total. In two short months and with help from his family, friends and local community he has raised an incredible total of £4,003.06.